The two-person team at Washbear Studios are delighted to announce that their dinosaur theme park/tycoon simulator, Parkasaurus officially hits Steam’s Early Access program on Tuesday, September 25th, 2018. The goal is to plan, design and construct exhibits that maximize the happiness of their dinos, and bring people to visit and see them/spend money. You start with only a dream of a dino park (and who doesn’t have one of those dreams?) and an abandoned park, players will discover new technology, create new attractions, and form a deep bond with all of their Dinos. As the days pass in Parkasaurus players will watch Dinos grow from little runts to giant best friends, unlock new accessories for them to wear, and help guide them through diverse seasons that each come with their own unique fun, beauty, and challenges. 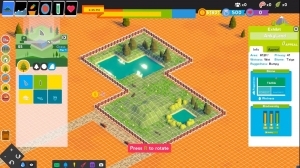 In Parkasaurus fortune is a real possibility and money management is an absolute necessity. It will be available for 19.99 on Steam on September 25th.